For much of the next half-century, Fleming was a fixture at WVU, announcing football and basketball games. Broadcaster Jack Fleming was born in Morgantown on February 3, 1923. After serving in World War II as a navigator on a B-17, he enrolled in West Virginia University through the GI Bill. In 1947, as a 24-year-old undergrad, Fleming became the “Voice of the Mountaineers” on radio. He took a three-year break in the early ’70s to call games for the NBA’s Chicago Bulls. But, he was lured back to his main love: WVU. Despite his longtime association with the Pittsburgh Steelers, he didn’t hold the same affinity for WVU’s leading rival, the Pitt Panthers. In the days leading up to the annual Backyard Brawl, he could be found in downtown Morgantown, waving a “Beat Pitt” sign at passing motorists. 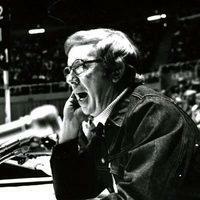 He took a three-year break in the early ’70s to call games for the NBA’s Chicago Bulls. But, he was lured back to his main love: WVU.